When you write a few times each week about comic book characters, you frequently find yourself debating heroes and villains because they are the most basic and essential ingredients in a good superhero story. Having a superhero without a good group of supervillains to thwart and overcome would be incredibly boring. And as I’ve mentioned numerous times here at Chasing Amazing, the more interesting the supervillains, the better the heroe’s story and ultimate triumph becomes. In Amazing Spider-Man #676, Marvel and writer Dan Slott treat readers to a most unusual tale: a superhero comic book that exclusively tells the story of the supervillains, with nary an appearance by the titular heroic character. 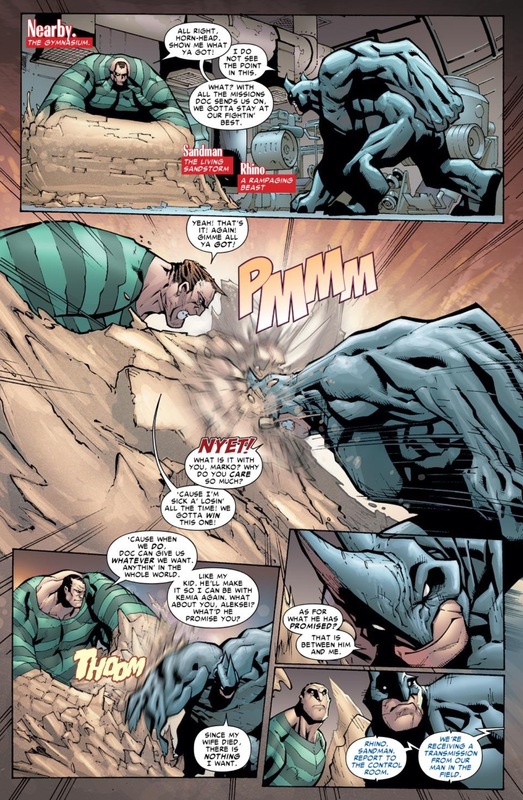 You very rarely see this in a mainstream comic book these days and for good reason – the story will derail almost immediately if the reader doesn’t have a reason to care about the villains, especially in the absence of the superhero. But ASM has been playing by its own rules for a quite some time now under Slott, and while he’ll occasionally strike out with one of the many risks he has taken since he started his run as full-time writer, ASM #676 clearly wasn’t one of those swings and misses. In fact, given the degree of difficulty of the maneuver he pulled off in this issue, an argument could be made that it was one of his strongest stories to date… though not necessarily a personal favorite (but that’s neither here and there). So maybe that’s an exaggeration of sorts, but the point still stands that attempting to tell an entire story around a supergroup of supervillains is a risky proposition, yet Slott and Co. still found a way by the end to get me excited about both the Sinister Six and the “Ends of the Earth” storyline they’re obviously going to dominate in a few months. The Sinister Six, as a group have been around for a very long time, through a number of incarnations, and while I remember being entertained by the early-90s “Return of the Sinister Six” storyline (I need to reread that at some point in anticipation of Ends of the Earth), I think this current collection of bad-guys is my favorite iteration of the group yet. For years, the common denominator of the group was Doctor Octopus, who by name alone and his positioning among the greatest Spider-Man villains of all-time, makes him the de facto leader. However, in recent years, we have the added element of Doc Ock being cognizant of the fact that he’s on the verge of death, so there’s an Ocean’s 11-esque feel to the group this time around based on the idea that this is going to be Otto’s last real “heist” and shot at knocking off Spider-Man. 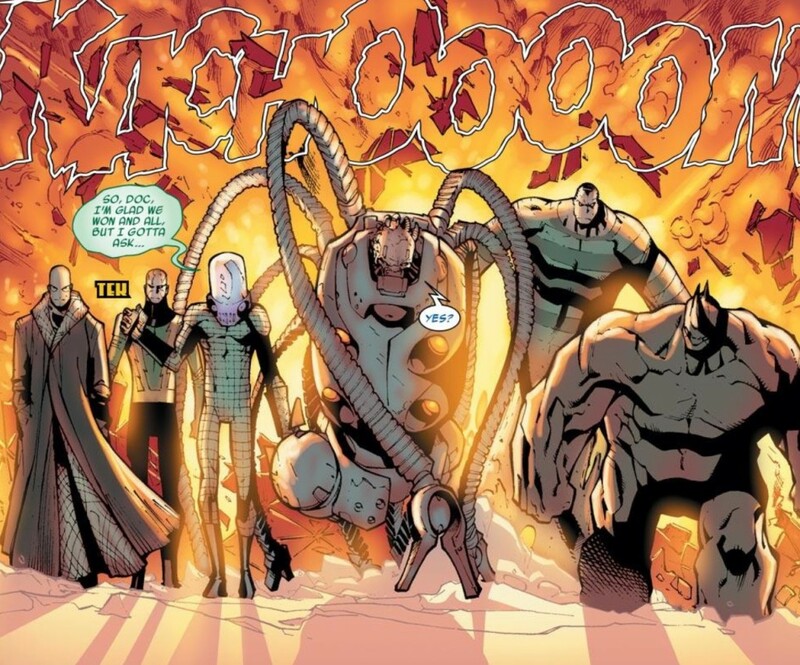 That alone, almost makes you want to silently cheer for Doc Ock, and Slott capitalizes on potentially reader sympathy, by giving the Six the hero treatment against fellow supervillain boy band Intelligencia. 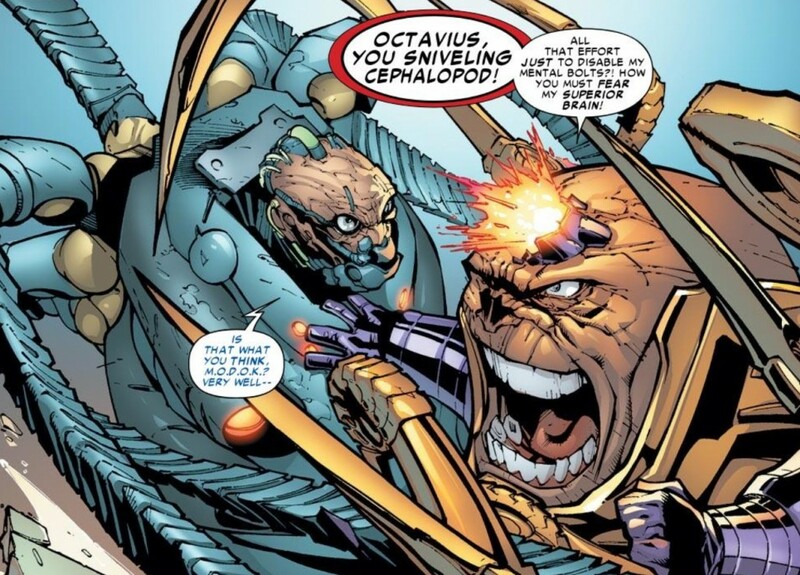 When Ock overtakes M.O.D.O.K and the Zero Cannon, it’s like a mini-“stand up and cheer moment” from the side of evil. And I don’t think that kind of pseudo-cheerful reaction can be generated, unless you’re dealing with a very sympathetic villain who has a ton of history in the Spider-Man canon. 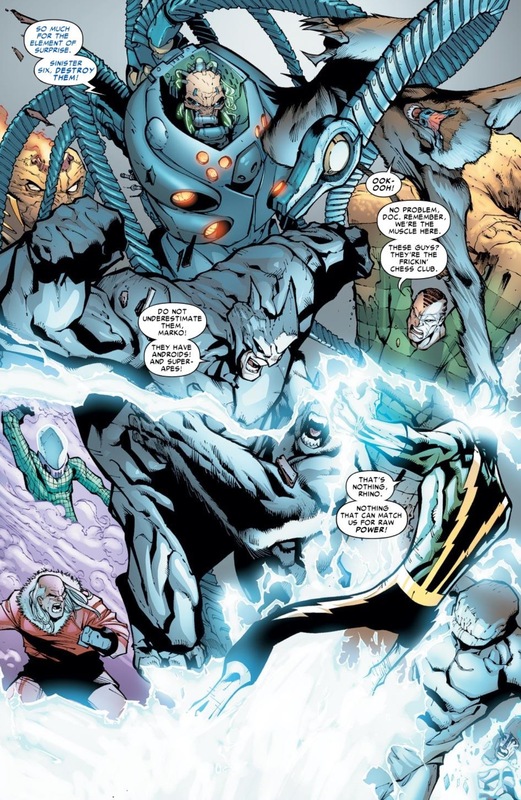 Beyond Doc Ock, the current Six boast other sympathetic figures like Rhino and Sandman, who both have interesting backstories involving children; Electro, who probably would have earned a few supporters from the Occupy Wall Street crowd with his recent “Power to the People” routine (and who displayed some rare physical prowess without his electrification powers during the showdown with the Intelligencia); and the old-school fun of guys like Mysterio and Chameleon. The issue also demonstrates the masterclass pacing by Slott, which was on full display a few months ago during Spider Island. 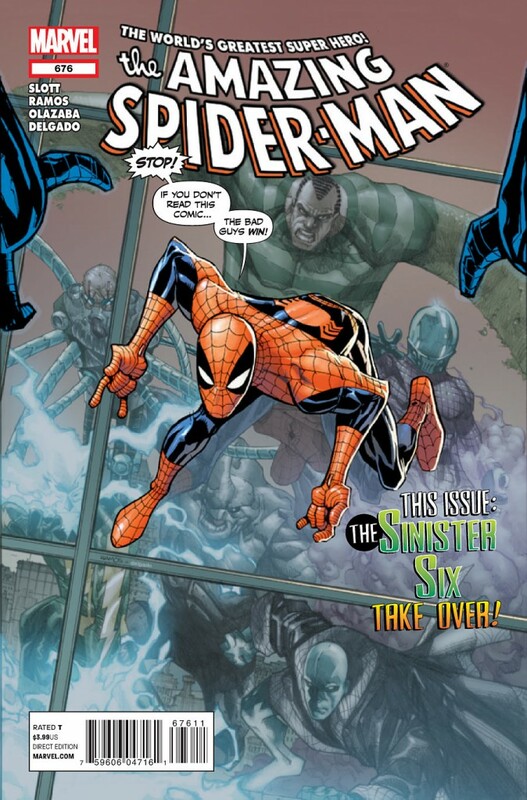 While Spider Island seemingly tied-up a number of loose ends dating back to the Big Time arc towards the beginning of 2011, you realize that the culmination of the new Sinister Six’s efforts date back to the same timeframe. Their plan first goes into action during Big Time, and then in the Spring’s Spider-Man/Future Foundation crossover, we see Doc Ock is able to outsmart Reed Richards and break into the Baxter Building. Slott’s using the slow burn approach to perfection and the fact that reader’s still won’t know exactly what’s about to happen with the Six until a few months down the line is engaging stuff. Using an entire issue of Spider-Man resources to remind fans that the Six are still out there and planning something really, really BIG, only works if you’ve been laying the groundwork for more than a year the way Slott has been doing.